A lot can happen in two years. The MLC football program can attest to that. Two years after a winless 2016 season, the Knights sit in first place in the UMAC with a 5-1 record (4-0 in conference play) and several nationally recognized players. Following a strong performance in a season-opening loss to Gustavus Adolphus (32-20), the Knights came from behind to win 28-24 at Rockford, thanks to a 68-yard touchdown strike from #4 Zach Bloomquist (WISCO / St. Jacobi-Greenfield WI, pictured) to Josh Arndt (St. Croix LA / Good Shepherd-Burnsville MN) with under one minute to play. That win got the ball rolling for the Knights, who opened league play on September 22 with a dominating 63-28 win at Greenville. Bloomquist accounted for five touchdowns (three rushing, two passing) in the win, and was named to the D3football.com Team of the Week for his performance. 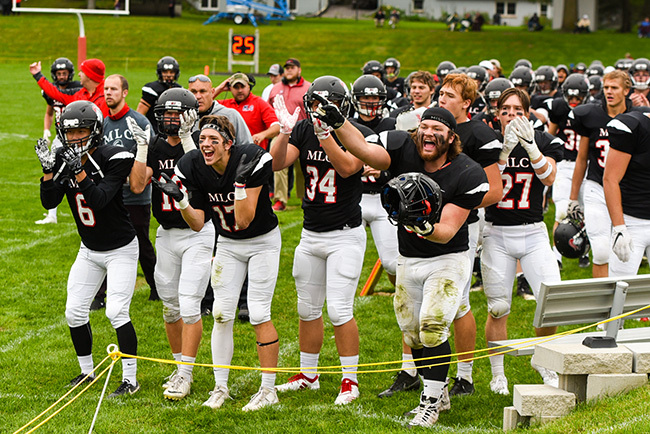 The following week, MLC proved it belonged with the best teams in the conference with a 49-21 win over St. Scholastica. The Knights trailed 21-7 in that game in the second quarter, but ripped off 42 unanswered points on the way to their first win over CSS since 2010. This time, it was defensive lineman Dan Gensmer’s (Michigan Lutheran Seminary / Abiding Love-Cape Coral FL) turn in the spotlight, as he became the first MLC defensive player in program history to be named to the D3football.com Team of the Week thanks to a three-sack effort. 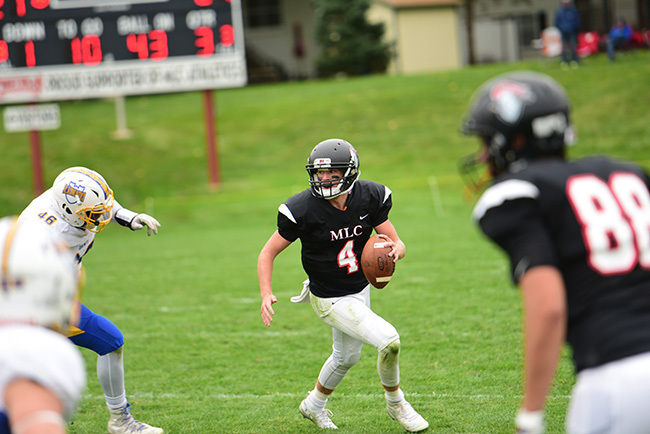 MLC came out of that game with a target on its chest, and the team needed second-half comebacks the next two weeks to remain unbeaten in league play. The Knights overcame a 21-7 deficit in the fourth quarter at Iowa Wesleyan, with Arndt once again scoring the game-winner on a 74-yard toss from Joshua Schroeder (Luther Prep / St. Peter-Modesto CA) on a trick play. The following week, the Knights scored four touchdowns in the second half to secure a 28-12 Homecoming win over Westminster. That victory, the fifth straight, put this team in the books, tied for most consecutive wins in program history. Through the season’s first six weeks, the Knights set new single-game records for total yards (711 at Greenville), passing yards (405 at Greenville), and rushing yards (477 v. St. Scholastica). They lead the UMAC in points (36.0), total yards (461.2), and rushing yards (265.8) per game on offense, while also ranking first in rushing yards allowed (90.2) and interceptions (nine) on defense. Four different players—Arndt, Bloomquist, Gensmer, and Austin DeNoyer (Lakeside LHS / St. Paul-Lake Mills WI)—have earned UMAC Player of the Week honors as well.